Refrigerated and frozen foods have always offered convenience, but in recent years the freezer and cooler aisles also have come to mean variety, gourmet, organic or natural. While creating entrees co-branded with restaurant chains, simple to complicated breakfast items or easy-to-prepare hors d'oeuvres, processors must maintain tight control over a broad array of ingredients and processes. 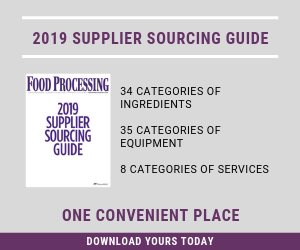 In the frozen food arena in particular, the bar has been raised on quality and flavor, while operations personnel are continually pressured toward higher levels of hygiene and productivity. To some extent, refrigerated and frozen food manufacturers are finding new solutions to challenges both old and new. From a technical standpoint, the most profound change in the last decade has been the move toward more inline freezing, and away from a dependence on slower cold room freezing. The most crucial change from a processing strategy standpoint has been the focus on hygiene and ensuring that freezing equipment meets ever-stringent food safety requirements, says Paul Osterstrom, vice president of sales support for GEA Refrigeration Canada, Richmond, B.C. (formerly Aerofreeze). Sometimes the two go hand in hand. Osterstrom's business unit supplies processors of meat, poultry, seafood, fruit, vegetables, French fries, bakery goods and other food products with in-line freezing equipment for products that eventually will be sold in the freezer cases of grocery stores, or to restaurants and institutions. "For example, a manufacturer of meatballs will have mixing equipment, a former, an oven or fryer, an in-line freezer and packaging equipment," Osterstrom says. "The in-line freezer has now been requested to become a piece of equipment or machinery that can be easily cleaned instead of just a freezer building." Higher-quality ingredients and the emergence of a more culinary approach to food science and product development have helped add excitement to frozen foods in the last 10-15 years. But the use of better processes and more sophisticated equipment also has played a major role in elevating quality. "If you go back a couple of decades, frozen food was a not so appealing, especially compared to the fresh alternatives. But consumers are now more familiar with the idea that if you freeze immediately, you preserve the freshness," Osterstrom says. "Salmon is a good example. The perception of freezing is better these days." The two phases in heat removal with cold air are convection and conductive heat transfer. "In the beginning, we use a very powerful air stream to remove the surface heat," Osterstrom says. "Once the surface is cold, then it is important to have the coldest temperature outside of the product to the drive the heat to the surface." Achieving efficient freezing requires appropriate sizing of the freezer. GEA Refrigeration Canada is using advanced engineering tools like Computational Fluid Dynamics (CFD) in the design of in-line freezers. This helps GEA consistently to design freezers more efficiently and cost effectively. "For years, knowing how to design a freezer has been an art in this business," says Osterstrom. "Today, food processors are requesting consistent and efficient freezing solutions with documented proof of performance. We have invested in technology to confirm the design of our freezer and test frozen food products in our Food Tech Center. This has proven to be very important when developing speedy and innovative freezing solutions for food processors." Like any other kind of manufacturing, refrigerated and frozen food producers look to control costs through automation. Making more eggrolls with fewer line workers is one way to help the bottom line, says John Kadinger, market manager at Key Technology, Walla Walla, Wash.
"It is an issue that will be with them into the foreseeable future—doing more with less," he says. Kadinger uses the example of a French fry manufacturer moving raw potatoes from the cutter to the fryer. Using high-tech optical sorters, those raw French fries can be sorted into multiple streams including rejects that will go to animal feed and irregulars that could be used as rework to make ground potato products. Modern sorters can feed data to a SCADA or some other control system that will allow for on-the-fly upstream adjustments, based on the qualities of those fries going into the frye, or, if they are placed downstream, they can provide information on the finished product. Either way, adjustments can be made more quickly. "It's important for the operators, or the equipment itself, to get as much information as possible in a way to it can be used," he says. "The sorter can tell the cutter to peel more or peel less or tell the fryer to fry more or to fry less." Key recently introduced a new line of optical sorters that uses four cameras to provide even more data than current equipment. A trend that Kadinger has seen is the positioning of scanner and sorting equipment in multiple locations. While it is crucial to catch defects just prior to packaging, earlier detection helps minimize waster of materials and energy, he says. "There is no point to using all that energy to process something that you are just going to throw away," Kadinger adds. With the use of higher-quality ingredients, and the ongoing efforts to reduce carbon footprints, plant operators are willing to do more to catch and segregate waste as early as possible in the manufacturing process. "In the past, the most important sorting was done just after the freezer, which indicates that you also freeze your defect," adds Frank De Brauwer, market manager at Tomra Sorting Solutions, a unit of Odenberg, West Sacramento, Calif. "Removing these defects earlier and before freezing gives energy savings, more storage capacity for good product." The emphasis on hygiene has led to changes in equipment, processes and construction. "Food safety has become a big concern all over the world," says GEA's Osterstrom. "Freezing equipment has to be easy to clean and must include CIP capabilities. We have emphasized this over the last 15-20 years, and that has helped us become one of the leaders in innovative hygiene freezing equipment." An easy-to-clean in-line freezer must be built based on stainless steel welded construction rather than bolted, Osterstrom adds. The construction needs to be open to ensure accessibility for easy cleaning and inspection, and there should be no hidden areas, no horizontal surfaces, etc., that will make the freezer difficult to clean. Much of the attention now is paid to the design of floors and enclosures. Previously, in-line freezers were built with enclosure panels that had caulked joints. These joints were found to harbor bacteria and were very difficult to clean. In-line freezers available from GEA Refrigeration Canada have stainless steel enclosures with welded seams, which is the most hygienic approach. "Bacteria can more easily grow in the caulked joints of the enclosures of floors and in crevasses created in a bolted design, since it is difficult to clean," Osterstrom points out. "Previously, welded designs were often an expense that was difficult for the food processor to justify. Now, they cannot afford not to have food-safe freezing equipment." Observations on the trends toward hygienic equipment and environments are echoed by Kurt Warzynski, process engineering manager at Stellar, Jacksonville, Fla. Stellar is a design-build firm that works extensively with food manufacturers, and its capabilities include freezing rooms and equipment integration. One technology adaptation Warzynski sees more of lately from food manufacturers is clean-in-place. Entire spiral freezer enclosures are now fitted with CIP, he says. "Without CIP you would have to shut down the spiral freezer, maintenance crews would have to walk into the freezer with hoses and scrub brushes and foaming units and spray everything down," Warzynski says. "And when they are done, they get out and let it dry before you could start it back up." Automated CIP systems on the other hand are faster and leave less room for human error. A maintenance team can work on other tasks while the equipment runs and then do a quick inspection and touch-up if needed once the rinse cycle completes. The movement toward CIP dovetails with trends toward hygienic design in equipment. Warzynski says clients who are building new plants and expanding them are more likely than ever to go with top tier freezing and refrigeration solutions. Not so long ago, the most exotic item in the frozen food aisle at the supermarket might have been something vaguely Chinese. Today's consumer can choose from items that are co-branded with celebrity chefs (example), or serious ethnic food (Saffron Road Crispy Samosas) or complete meals that cater to common dietary concerns, or organic offerings (Amy's Mushroom Risotto Bowls). "We fill each pastry with a savory mélange of farm fresh vegetables, lentils and mashed red potatoes. Add a touch of garlic and a dash of aromatic fennel and this is a vegan appetizer that will titillate every palate, and bring joyful delight to your guests." Today's frozen foods are a far cry from the functional TV dinner that once offered little beyond convenience. The sea-change in product diversity has definite implications on the plant floor. As noted previously, the need to minimize waste became elevated when rare spices or organic vegetables are included. GEA's Osterstrom says the complexity of frozen foods makes for interesting challenges. "I really do like working in this field because each product has its own attributes and characteristics," he notes. "We have the means to match the right equipment to a specific food application, and that is key. It is easy to simplify the characteristics of a food product. For example a blueberry is not just a blueberry – it can be a cultured blueberry or wild grown and can have differences in size and sugar content. All of these details are important when designing freezers. As a freezer manufacturer, we know the requirements in freezing different foods and take this into consideration during the selection, design and manufacturing process."